We review the current state of knowledge of quantified impacts of invasive alien plants on water quality, with a focus on South Africa. In South Africa, over 200 introduced plant species are regarded as invasive. Many of these species are particularly prominent in riparian ecosystems and their spread results in native species loss, increased biomass and fire intensity and consequent erosion, as well as decreased river flows. Research on the impact of invasive alien plants on water resources has historically focused on water quantity. However, although invasive alien plants also affect the quality of water, this aspect has not been well documented. Alien invasive plants increase evaporation rates, and reduce stream flow and dilution capacity. The biomass inputs of alien invasive plants, especially nitrogen fixers such as Acacia spp., alter nutrient cycles and can elevate nutrient concentrations in groundwater. 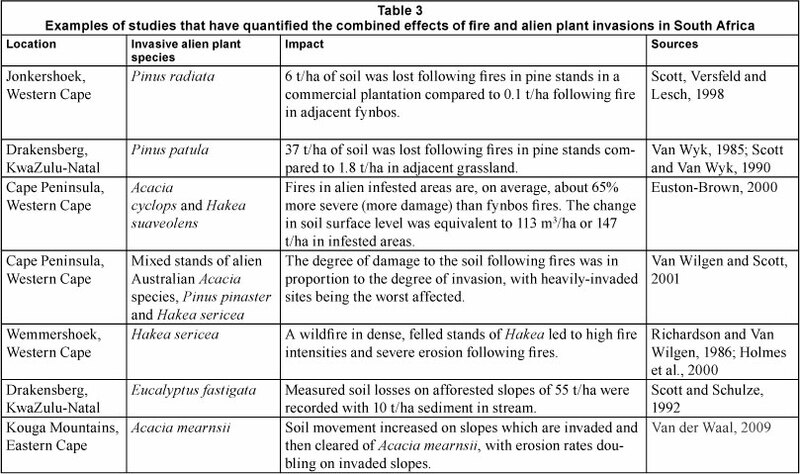 Alien plant invasions alter the fire regimes in invaded areas by changing the size, distribution and plant chemistry of the biomass. More intense fires increase soil erosion and thereby decrease water quality. In contrast to riparian invasions, aquatic invasive plants have been more extensively studied in South Africa and their impacts on water quality have been relatively well monitored. Water quality in South Africa is rapidly deteriorat-ing, and all factors that influence this deterioration need to be taken into account when formulating actions to address the problem. The changes in water quality brought about by alien plant invasions can exacerbate the already serious water quality problems. 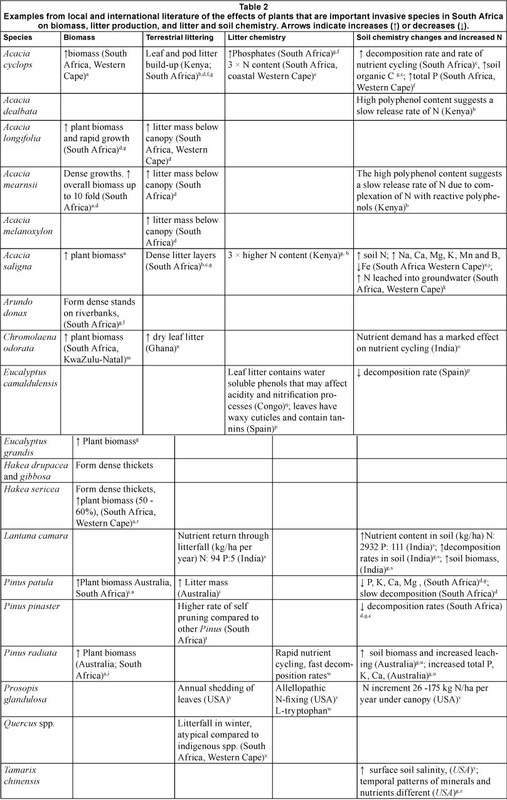 Invasive alien plants are a significant environmental problem in South Africa's terrestrial and freshwater ecosystems (Richardson et al., 1997). Alien trees and shrubs increase above-ground biomass and evapotranspiration and thereby decrease both surface water runoff and groundwater recharge (Görgens and Van Wilgen, 2004). The increased biomass and evapotranspiration rates associated with invasive alien plants arise because of their greater height, root depth and senescence, compared to the native species that they replace (Calder and Dye, 2001). The increased biomass that accompanies plant invasions also results in more intense fires that damage the vegetation and soil and lead to excessive erosion; in addition, invasive alien plants reduce the capacity of rangelands to support livestock and wildlife, and significantly reduce biodiversity (Richardson and Van Wilgen, 2004). The reduction in surface water runoff as a result of current invasions was estimated to be 3 300 Mm3 (about 7% of the national total, Le Maitre et al., 2000), most of which is from the fynbos (shrubland) and grassland biomes (Van Wilgen et al., 2008). These areas are especially sensitive to invasions as most of South Africa's surface water originates from the Drakensberg mountain grasslands, and from the Cape mountains which are dominated by fynbos vegetation (Turpie et al., 2008). The Cape fynbos has been invaded by alien plants that have escaped from commercial plantations and woodlots on farms (i.e. Pinus, Acacia and Eucalyptus species), and grasslands' ecological integrity has been compromised by poor land use management practices, which include overgrazing and burning regimes, and damming and reclamation of wetlands (Turpie et al., 2008). The potential water reductions would be more than 8 times greater if invasive alien plants were to occupy the full extent of their potential range (Van Wilgen et al., 2008). These invasions come at a significant cost to the economy, estimated at about R6.5 billion per annum (about 0.3% of South Africa's GDP of around R2 000 billion), and with the potential to rise to > 5% of GDP if invasive plants were to be allowed to invade all of the suitable habitat (De Lange and Van Wilgen, 2010). The importance of these impacts has long been recognised, and in 1995 led to the establishment of a national programme (Working for Water) to control invasive alien plants and reduce their negative impacts (Van Wilgen et al., 2011). The programme has an annual budget of R500 million and a number of criteria have been developed to prioritise and control operations to ensure that these funds are deployed to areas where they will be most cost-effective (see, for example, Roura-Pascual et al., 2009). Criteria include the magnitude of the impacts on water resources and rangeland condition, and the need to conserve biodiversity, reduce fire hazard and alleviate poverty. The impacts of invasive alien plants on surface water runoff and groundwater recharge are relatively well understood and can be used to set priorities. Although scientists recognise that invasive alien plants have negative impacts on water quality as well as quantity, a shortage of information regarding these impacts has prevented them from being considered in prioritisation exercises by institutions such as Working for Water. This paper addresses that gap by reviewing the impacts of invasive alien plants on water quality. Our goal was to identify which impacts had been recognised and quantified, both internationally and in South Africa, as well as to identify important gaps in our knowledge. Implications of reductions in streamflow and groundwater storage. Reductions in stream flow and groundwater recharge rates are brought about by increases in evapo-transpiration caused by invasive alien plants; this results in reduced dilution and greater concentrations of nutrients, pollutants and suspended solids in water. Plant biomass and nutrient cycling. Increased biomass and litter production associated with invasive alien plants could result in changes in litter chemistry, nitrogen fixation, and changes in soil chemistry in the natural biome which impact on water quality. Fire regimes, soil erosion and water quality. Invasive alien plants alter vegetation structure, increase fuel loads and change fire behaviour, which can lead to soil damage and erosion, thereby adversely affecting water quality. Aquatic alien plants and water quality. Alien plants that invade aquatic environments can directly affect water quality by their presence in or on water bodies. Many species of invasive alien plants, especially trees and shrubs, have higher evaporation rates than indigenous species do and, therefore, use more water than the vegetation they replace (Malan and Day, 2002). The increased evaporation results in reductions in river flows and reduced groundwater reserves (Malan and Day, 2002). The reduction in the amount of water in the river reduces its dilution capacity, resulting in increased concentrations of nutrients and pollutants, increased salinity and altered buffering capacity of the ecosystem (Malan et al., 2003; Enright, 2000; Nagler et al., 2008). More studies have focused on the impacts of dilution capacity during flash floods and high runoff seasons than on the impacts of reduced water quantity (Table 1). Reduced dilution capacity, however, can also have severe impacts on water quality. Water with high salinity has an unpleasant taste, poses a human health risk (DWAF, 1996), reduces crop yields and causes corrosion of industrial pipes (DEAT, 2000). High concentrations of point-source pollutants such as heavy metals can be toxic to human health and tend to bioaccumulate in the riparian vegetation (Mishra and Tripathia, 2008; De Wet et al., 1990). Increased nutrient concentrations contribute to eutrophication processes, resulting in potentially toxic algal blooms (Malan and Day, 2002; Malan and Day, 2003a,2003b; Rossouw, 2004). Only one study attributed these effects directly to invasive alien plants. Invasions of Tamarix chinensis were found to have almost quadrupled groundwater salinity (from 2 250 mg/ℓ to 5 000 and 10 000 mg/ℓ) by increasing evapotranspiration in the Colorado River in the United States (Nagler et al., 2008). Very few studies have quantified the impacts of invasive alien plants on stream flow, runoff or groundwater recharge. The initial studies in South Africa (Le Maitre et al., 1996; Le Maitre et al., 2000) used measured reductions in stream flow arising from forestry plantations (see Dye, 1996) to estimate the potential effects of invasion of pristine ecosystems by similar species. This approach is justifiable because invasions also develop into dense stands with similar structure and bio-mass, although plantations are managed to maintain high wood production and invasions are not. In addition, invasions often include the river floodplains and riparian zones, where trees have high transpiration rates (Scott 1999; Dye and Jarmain 2004). Dye and Poulter (1995), Prinsloo and Scott (1999), and Dye and Jarmain (2004) quantified the increases in surface runoff that follow the clearing of invasive trees and shrubs, which provides support for the assumptions made in earlier studies. The magnitude of reductions depends on the annual rainfall, and the invasive alien species concerned. Typical examples of results from plantations include: an 82% reduction in stream flow in the KwaZulu-Natal Drakensberg 20 years after planting grasslands with pines (Bosch 1979); a 55% reduction in stream flow in the Western Cape 23 years after planting pines in fynbos (Van Wyk, 1987); and the total drying up of streams 6 to 12 years after completely replacing grassland with pines and eucalypts in the Mpumalanga Province (Van Lill et al., 1980). More recently, Cullis et al. (2007) calculated that the total loss of usable water due to the invasion of alien plants in catchments receiving more than 800 mm of rainfall per year is 695 Mm3, 75% of which is due to invasions of riparian areas by alien plants. Combined with non-riparian invasive alien plants, this accounts for 4% of the total registered water use in South Africa. Our review revealed that few studies have quantified the effects of invasions on water quality resulting from increases in evapotranspiration and, thus, decreases in river flows and dilution capacity. Most impacts are inferred and are not supported by measured data. The influence of invasive alien plants on water quality is intimately linked to site-specific processes, making it difficult to isolate causal factors (Malan, 2011) Evapotranspiration rates are also site- and season-specific, which makes it difficult to generalise findings. Alien invasive plants change the amount and structure of biomass, which changes carbon and nutrient dynamics (Table 2). Invasive alien plants typically grow more rapidly, often increasing the proportion of biomass contributed by alien plants. This includes leaves, bark, seed, flowers and twigs that become 'terrestrial litter' after abscission (Aerts, 1997). Such litter enters and is retained in water bodies, where its rate of breakdown by invertebrate feeding as well as fungal and bacterial activity can differ from that of inputs from indigenous plants (Stewart and Davies, 1990). The often large differences in litter inputs from invasive alien plants relative to indigenous species can dramatically alter the nutrient cycle in ecosystems (Stock et al., 1995). Increases in the biomass contributed by alien plants can increase the amount of metabolised nutrients, which escalates natural eutrophication processes (Kalff, 2002) as well as free-floating and rooted aquatic macrophytes invasions (Lee, 1973). Eutrophication leads to gradual changes in the plant and animal populations, the development of potentially toxic algal blooms and therefore a slow decline in water and habitat quality (Kalff, 2002). The level of impact that litter from invasive alien plants has on nutrient cycles is determined by vegetative spread, plant structure, phenology, plant water and nutrient uptake efficiency, photosynthesis type, presence of symbionts and nitrogen fixation, phosphorus content and tissue chemistry (such as allelopathy) (Ehrenfeld, 2003). Nitrogen fixation, for example, is a natural process by which nitrogen gas (N2) is converted to biologically-useful ammonia (NH3) (McNeill and Unkovich, 2007). In a symbiotic relationship with bacteria, legumes form nodules on the roots to fix nitrogen gas which can then be used by either plants or animals (Lindemann and Glover, 2003). Nitrogen fixation by legumes can be in the range of 2.5-7.4 kg of nitrogen per 1 000 m2 per year in natural ecosystems, and several hundred kilograms in a cropping system (Lindemann and Glover, 2003). The majority of nitrogen-fixing plants are in the flowering legume family Fabaceae, of which the genus Acacia is the second largest, with over 900 species. Australian acacias are important invaders of South African fynbos areas in the Western Cape (Yelenik et al., 2004; Jovanovic et al., 2009). Fynbos areas are generally nutrient-poor and the invasion by nitrogen-fixing acacias increases nitrogen input and soil fertil-ity, thus allowing for Acacia species to propagate and outcom-pete indigenous species (Stock et al., 1995). N-fixation has been reported for Acacia cyclops (Stock et al., 1995; Virtue and Melland, 2003), A. dealbata (Musil, 1993), A. mearnsii (Musil, 1993) and A. saligna (Stock et al., 1995). A study of A. saligna in the Western Cape showed that groundwater in invaded and recently cleared plots had elevated NO3- and NO2- concentrations (up to 12 mg/ℓ) compared to groundwater in natural fynbos plots (up to 3.3 mg/ℓ) (Stock et al., 1995; Jovanovic et al., 2009). The presence of A. saligna, as well as the nutrient leaching that occurred after its removal, resulted in seasonal nitrogen concentrations that were higher than the water quality targets for domestic use (NOx < 6 mg/ℓ) (Jovanovic et al., 2009; DWAF, 1993). Clearing of A. saligna resulted in an initial flushing of nitrogen out of the soil, but nitrogen concentrations normalised after that. The results suggest that removal of the alien plants would be beneficial from both a water quantity as well as water quality perspective (Jovanovic et al., 2009). Allelopathy is the process through which invasive plants such as eucalyptus (Al-Naib and Al-Mousawi, 1976), pines (Durvey et al., 1999), Chromolaena and Lantana (Sheeja, 1993) produce biochemicals that influence the growth, survival and reproduction of indigenous species. These biochemicals can act as antibiotics in certain soils, possibly impacting on nitrogen cycles (Couto and Betters, 1995). Phenolics and volatile compounds can be released from eucalyptus foliage (Al-Naib and Al-Mousawi, 1976). These may subsequently impact on water quality through soil erosion or surface runoff processes. These possible impacts of allelochemicals on water quality have, however, not yet been evaluated. Many South African alien invaders, for example trees in the genera Acacia and Pinus, increased the biomass of an invaded area, by either dense overgrowth or excessive terrestial littering, and therefore add additional nutrients to the system (Van Wilgen and Richardson, 1985; Versfeld and Van Wilgen, 1986; Ehrenfeld, 2003; Virtue and Melland, 2003). Alien invasive plants are capable of changing the soil chemistry by either slow decomposition processes or nitrogen-fixing which, in turn, is assumed to impact on the water quality (Jovanovic et al., 2009; Ehrenfeld, 2003), although there is very little supporting evidence of this. There is a significant gap in our understanding of the changes in soil chemistry, and the resulting changes in soil and groundwater chemistry and overall water quality. The impacts of alien invasive biomass on eutrophication processes are therefore a complex matter, in need of quantified data and extended research. As the primary nutrient responsible for eutrophication is phosphorus (Lee, 1973), the nitrogen-fixing and cycling abilities of the alien invaders alone will not account for their contribution to these processes. Fynbos produces large amounts of secondary plant compounds, known as polyphenolics, which decompose to form humic and other weak organic acids (Dallas and Day, 2004). These leaching humic acids are known to darken the water, decrease the pH and reduce the amount of phosphorus in water. Berzelia lanuginosa (Bruniaceae) and Elegia thyrsifera (Restionaceae), a fynbos shrub and reed, respectively, were studied for their decomposing impacts on soluble reactive phosphorus (SRP), ammonium and polyphenol concentrations in water (Raubenheimer and Day, 1991). The studied fynbos showed a linear leached polyphenol concentration in water over time which later complexed with SRP, reducing the leached amount of biochemically-available phosphate. For fertiliser applications, humic acid containing manures are frequently added to soils to increase the biochemically-available amount of phosphorus (Winarso et al., 2011). The presence of dissolved humic compounds can therefore either reduce the amount of phosphate or increase the biochemically-available phosphorus in a given ecosystem (DWAF, 1996b), depending on the pH and available bacteria (Winarso et al., 2011). Although phosphorus is seldom found in quantity in unpolluted water (Dallas and Day, 2004), the impact alien invasive plants have on phosphorus cycling mechanisms and processes will also have to be investigated more closely to determine their holistic impact on eutrophication processes. Plant invasions can change the structure, biomass (Van Wilgen and Richardson, 1985; Jayiya et al., 2004) and spatial distribution of plant parts in invaded vegetation (Brooks et al., 2004), leading to increases in fire intensity (Versfeld and Van Wilgen, 1986; Scott and Van Wyk, 1990). More intense fires generate water-repellent layers in the soil, leading to increased soil erosion after rains (Smith et al., 2011). Erosion increases sediment loads in water, affecting its quality. Fuel loads. Invasion of mountain fynbos by pines can increase biomass in fynbos and grasslands by up to 300% (Versfeld and Van Wilgen, 1986). Studies in South Africa have assessed a number of alien invasive species in terms of biomass and fire intensity (Van Wilgen and Richardson, 1985; Jayiya et al., 2004). Invaded areas typically have greater fuel loads than indigenous vegetation: for example A. cyclops (317% increase), A. saligna (50% increase), H. sericea (60% increase) and P. pinaster (743% increase). Increased fuel loads have also been observed due to the accumulation of slowly decomposing litter from P. pinaster and P. patula (De Ronde, 1984; Morris, 1995). Plant tissue chemistry (flammability and moisture content). Chromolaena odorata leaves contain essential oils, resulting in flammable foliage leading to fires that burn with higher intensity compared to indigenous plants (Pammenter et al., 1985). The moisture content (as percentage of oven-dry weight) of live foliage differed among invasive alien plants: A. cyclops 120-140%, A. saligna 270%, H. sericea 110%, P. pinaster 118-175%; this affects fire risk (Van Wilgen and Richardson, 1985; Jayiya et al., 2004). Horizontal and vertical continuity. Acacia cyclops and Pinus pinaster increased the vertical and horizontal continuity of fuels, facilitating fire spread (Jayiya et al., 2004). Arundo donax, a reed species that invades drainage lines, can increase the amount and especially the vertical continuity of fuel, causing more intense fires and carrying fires into the crowns of trees (Brooks et al., 2004). Chromolaena carries fires into the canopies of areas that generally don't burn with very high intensity (Zachariades and Goodall, 2000). High intensity fires can lead to the development of water repellency, or 'hydrophobicity' in soil (Adams et al., 1970; DeBano and Conrad, 1976; DeBano, 1981; Keeley, 2009). The water-repellent layer is formed as hydrophobic materials (such as resins) are volatized during fire near the soil surface and then distil downward according to the temperature gradient within the soil profile. Some 50-95% of the substances moving from burning litter into sand were recorded as being capable of causing water repellency (Savage, 1974). Hydrophobicity inhibits water infiltration and/or percolation and thus increases the proportion of overland flow, accelerating soil erosion (Scott and Van Wyk, 1992). Soil erosion, caused by water repellency, increases the sediment load in a water resource. Sediment transport has been reported to increase up to 1 459 times after fires (Smith et al., 2011). The sediment loads after fires are also determined by the slope (9.9 t/ha per year on 15° slope versus 25.9 t/ha per year on 32° slope, (Scott, 1993)), fuel load, the soil geomorphology and the fire location relative to the riparian zone and the main channel flow (D.C. Le Maitre, personal observation). In addition, alien invasive plants typically suppress ground-cover and under-storey vegetation and the absence of these shallow root systems increases the likelihood of soil loss after a fire (Scott et al., 1998). The increased rate of sediment runoff on post-fire ground surfaces impacts on water quality and is region specific. The sediment runoff increases the turbidity and salinity, decreases pH (Bayley and Schindler, 1991), elevates water temperature, and increases nutrient loads (Smith et al., 2011), thereby accelerating eutrophication processes and temporarily increasing the concentrations of pollutants such as toxic heavy metals (Gallaher et al., 2002; Crouch et al., 2006; White et al., 2006; Smith et al., 2011) and the numbers of disease-carrying micro-organisms (Crouch et al., 2006; Smith et al., 2011; Doerr et al., 2011; Smith et al., 2011). There are several South African studies that document increased erosion rates after fire events (Table 3), confirming international experience that has also documented negative effects of fire on water quality (in Australia by Lane et al. (2006), Wilkinson et al. (2009) and Sheridan et al. (2007); in Canada by Petticrew et al. (2006); in the United States by Reneau et al. (2007) and Moody and Martin (2009)). Several alien aquatic plant species are important invaders of rivers and water bodies in South Africa. These plants, including Eichhornia crassipes (water hyacinth), Pistia stratiotes (water lettuce), Salvinia molesta (kariba weed), Myriophyllum aquaticum (parrot's feather) and Azolla filiculoides (red water fern) have become relatively widespread, forming dense mats in nutrient-rich aquatic ecosystems, either as floating weeds or rooted to shallow sediments or river banks (e.g., parrots feather). Invasions of aquatic weeds are associated with a range of impacts on water quality (Table 4). Dense mats of these weeds can impede water flow, which increases the rate of siltation in water bodies, and inhibit the diffusion of air into water, resulting in lower concentrations of dissolved oxygen (Raid and Munshi, 1979; Téllez et al., 2008). Lower oxygen concentrations, combined with the increased amounts of organic detritus that collect beneath these floating mats, can increase sediment accumulation rates and accelerate eutrophication processes. Increased eutrophication can be lethal to fish, cause algal blooms and render the water toxic and uninhabitable for native animal and plant species (Pieterse, 1989). Dense mats of floating plants limit light penetration and thereby prevent the development of planktonic algal blooms, a typical result of eutrophication. Typical examples were seen with infestations of E. crassipes in Lake Victoria (Mailu, 2001) and S. molesta in Lake Kariba on the Zambezi River (Williams and Hecky, 2005). Although the eutrophication of these water bodies is primarily due to anthropogenic inputs (Mailu, 2001; Williams and Hecky, 2005), the invasion and rapid spread of aquatic weeds are indicators of declining water quality through eutrophication (Hill and Olckers, 2001). Invasions by aquatic weeds have been linked to increases in water-borne, water-based and water-related diseases. Eichhornia crassipes infestations have been linked to increases in the gastropod vectors (Biomphalaria and Bulinus) that act as an intermediate host for schistosomiasis (bilharzia) in Lake Victoria (Okedi, 1990; Masifwa et al., 2001). Eichhornia crassipes has also been shown to adsorb Vibrio cholerae from contaminated water in Bangledesh (Spira et al., 1981). Salvinia molesta provides habitat for mosquitoes, which are vectors for diseases such as dengue fever, elephantiasis, encephalitis and malaria (Oliver, 1993) and S. molesta infestations have assisted in the spread of these diseases in Sri Lanka. The proliferation of P. stratioides on Lake Guiers in the River Senegal has accelerated the rapid spread of schistosomiasis, which affected up to 80% of the population of some lakeside villages (Cogels et al., 1997). Azolla filiculoides, which is known to be nitrogen-fixing, has a symbiotic relationship with cyanobacteria, which produce the neurotoxic non-protein amino acid β-methylamino-L-alanine (BMAA). Consumption of BMAA causes serious neurodegenerative disease such as amyotrophic lateral sclerosis/parkinsonism-dementia complex (AL-SPDC) (Cox et al., 2003). Biomagnification of BMAA tin the Guam ecosystem, has increased the incidence of amyotrophic lateral sclerosis in humans 50- to 100-fold (Cox et al., 2003). Production of known neurotoxins has also been considered phylogenetically unpredictable. A single neurotoxin, β-N-methylamino-L-alanine, may be produced by all known groups of cyanobacteria, including cyanobacterial symbionts and free-living cyanobacteria. The ubiquity of cyanobacteria in terrestrial, as well as freshwater, brackish, and marine environments, suggests a potential for widespread human exposure (Cox et al., 2005). Of the aquatic weeds reported on here, only A. filiculoides has been reported to exhibit nitrogen-fixing abilities due to its symbiotic association with cyanobacteria (Hussner, 2010). Symbiotic relationships between cyanobacteria and S. molesta and E. crassipes were also observed, but nitrogen-fixation occurred on a much smaller scale compared to Azolla spp. (Barik et al., 2000). Increases in cyanobacteria numbers caused by their symbiotic relationship with aquatic weeds, add to the eutrophication processes in the water resource. Control operations aimed at reducing the extent of invasive aquatic weed mats can also have an impact on water quality. Submerged, emergent and floating water plants are often controlled using a variety of herbicides such as diquat, glypho-sate, amitrole and the amine and acid formulations of 2,4-D (Williams and Hecky, 2005). This exposes humans, fish and livestock to potentially toxic chemicals in their drinking water (Williams and Hecky, 2005). Uncleared, dead or decaying weed soon turns into rotting biomass that can lead to localised de-oxygenation, contributing to eutrophication and other detrimental impacts upon the water body (Mallya, 1999). Decaying biomass may also result in the water having an unpleasant taste and odour (Jones, 2001). In general, a dramatic reduction in the concentration of dissolved oxygen is observed and slightly more acidic conditions are expected for all of the aquatic invasions reviewed (see Table 4). The 5 invasive aquatic plant species investigated in this study extract phosphate, nitrogen and various heavy metals from water, to various degrees. 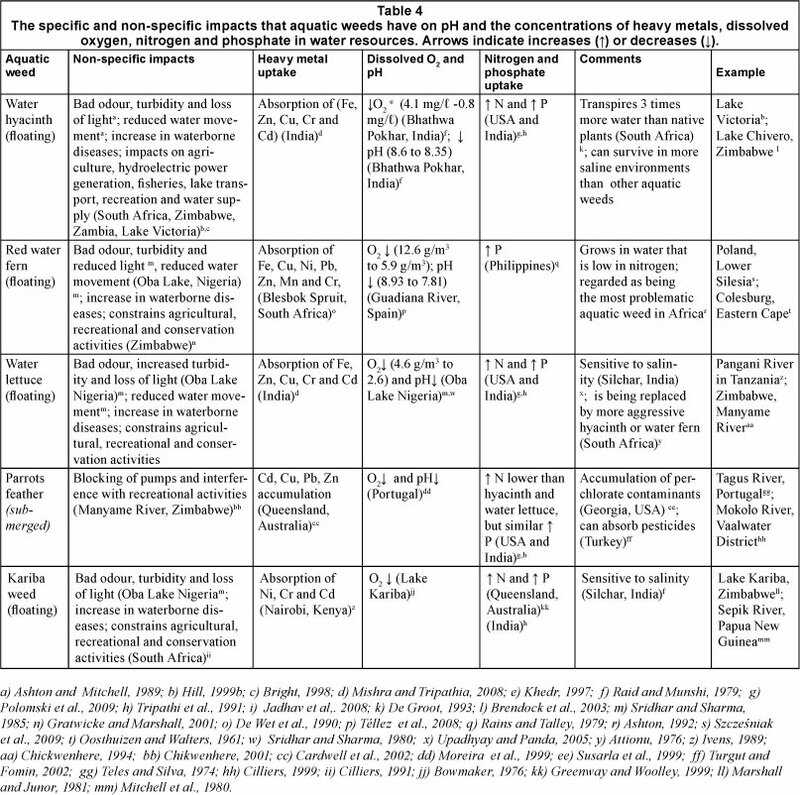 It is due to this uptake capability of aquatic weeds that many reports and evaluations suggest their possible use in the removal of toxic heavy metals from mining wastewater (Mishra and Tripathia, 2008). The benefits of heavy metal extraction by the weeds have, however, not yet been exploited to balance their negative impact on water quality. The available literature suggests that E. crassipes has the greatest impact on water quality, of the 5 species. It has the highest rate of nutrient uptake, causes significant reductions in dissolved oxygen, and has a high water transpiration rate (Lallana et al., 1987) (which leads to a decreased dilution effect). This species is not yet entirely under any form of control (Coetzee et al. 2011) in South Africa and is likely to continue to have significant impacts on water quality. In general, South Africa is a water-scarce country and almost all of its accessible freshwater has already been allocated for use (of which agriculture, industry and mining are the largest users) (DWA, 2010). The shortage of available water is exacerbated by water quality problems at a national scale. These include unacceptably high nutrient concentrations at 71% of the country's monitoring sites, as well as 30% of monitoring sites having unacceptably high levels of salinisation (DWA, 2011). Situations such as these are caused by poorly functioning wastewater treatment works, run-off from unserviced areas, agricultural runoff, industrial wastewater discharges and mining impacts (Scott, 1995; Burger and Nel, 2008; DWA, 2011). Against this backdrop of a looming water quality crisis and the growing scarcity of water, the water quality impacts of alien invasive plants are likely to be minor. Nonetheless, they worsen an already dire situation; in addition, eutrophication promotes invasion by aquatic weeds, initiating a downward spiral of invasion and decreasing water quality. Aquatic weeds have flourished in certain South African water resources which have been nutrient enriched by ineffective municipal treatment plants and sewage effluent (Van Ginkel, 2011). In these areas alien invasive plants may result in further deterioration and exceedance of fitness-for-use thresholds. Aquatic weed invasions in Lakes Kariba and Victoria (Ashton and Mitchell, 1989; Hill, 1999b) are examples where waters were being enriched with nutrients by sewage pollution, which created ideal conditions for the spread of water hyacinth and Kariba weed. These infestations further reduced the water quality, inhibited water transport and became a breeding ground for waterborne pathogens. A good example of the impact of invading plant biomass-related impacts on water quality is the invasion of the Western Cape fynbos by Acacia saligna, which increased nitrate and nitrite concentrations beyond acceptable water quality thresholds (DWAF, 1993; Jovanovic et al., 2009). Furthermore, the impacts of allellopathy, recorded in species such as Lantana camara, and species of Prosopis and Eucalyptus, on water quality have not been adequately investigated. It is conceivable that the phenol-containing terrestrial litter of Eucalyptus species could affect water quality in terms of acidity, organic matter accumulation and nitrification processes, but this has not yet been substantiated by quantitative data. The implications of alien invasive leaf litter decomposition, from species such as Eucalyptus and Quercus, on nutrient dynamics, and the subsequent impacts on water quality, are also yet to be determined. The impacts of invasive alien plants on water quality, while not considered to be as important as those on water quantity, should also be addressed, particularly in areas where the impacts may worsen already serious water quality problems. This review provides a starting point for the identification of some of these impacts, but it is clear that much research still needs to be carried out if a defensible assessment of the magnitude of the problem is to be made. In the interim, and with some exceptions in limited areas, it is likely that the priorities for clearing invasive alien plants will be dictated by their impacts on water quantity, both in terms of streamflow discharge and groundwater recharge. Prioritised impacts not reflecting on water quantity effects include areas with high levels of erosion following severe fires in invaded stands in fynbos, nitrogen pollution problems in aquifers where nitrogen-fixing Acacia species have invaded, and water bodies (particularly impoundments) where aquatic weeds have become dominant. We thank the Working for Water programme for funding this review, and Dr H. Malan for useful comments on an earlier draft. Accepted in revised form 18 April 2012.